When NASA’s Curiosity rover landed on Mars in August 2012, millions of people across the globe tuned in to watch. It was the culmination of nine long years of effort — and it went off without a hitch. In particular, we marvelled at the ingenious method designed by the engineers at the Jet Propulsion Laboratory to lower the one-ton rover onto the red planet’s surface: a hovering sky crane powered by booster rockets. This was a £1.76 billion mission, involving hundreds of scientists and engineers, but JPL engineer Adam Steltzner was front and centre as the mission’s public face. Known for sporting snazzy belt buckles, cowboy boots, and a shock of pomaded hair, he didn’t look at all like your stereotypical engineer; he looked more like the rock star he once aspired to be. But his creative, iconoclastic bent found a perfect match in the freewheeling environment of JPL. And JPL found a natural-born leader. 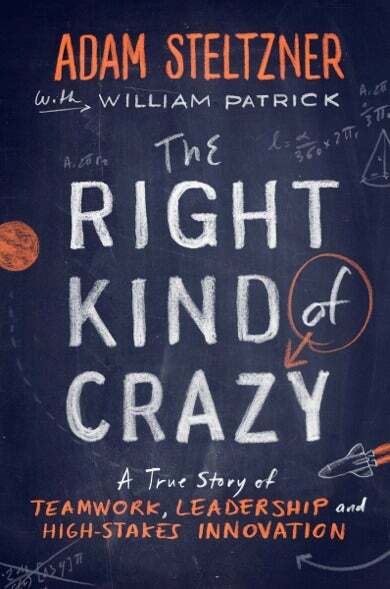 Now Steltzner has written his own account of that nine-year journey in his new book, The Right Kind of Crazy: A True Story of Teamwork, Leadership, and High-Stakes Innovation. (You can read an excerpt here.) Gizmodo caught up with Steltzner for the lowdown on what he learned along the way about himself, and about failure modes and creative problem-solving. Gizmodo: What made you decide to write your own book about your experiences getting the Curiosity rover to Mars? Adam Steltzner: I didn’t really appreciate how much work it was going to be; I’m not sure I would have done it if I had. But I love the Jet Propulsion Laboratory. I think it’s a great, honest meritocracy, and I have watched the way people work here and tried to learn from the best of them. I wanted to share that. One of the greatest things about writing this book was the opportunity for reflection and introspection and analysis of what we do here. Things happen very quickly, and then you cross the finish line and you think, “Whoa, what just happened there?” I spent nine years of my life on this project. [The writing process] gave me the chance to look back across my whole career to connect the dots. I love connecting the dots. Most frequently we fail because we don’t connect the dots. It’s not for lack of fact that we fail. It’s for lack of connection between facts — not understanding how facts are linked together. You talk a lot in the book about the critical difference between fear-based and curiosity-based decision making. What do you mean by that? Steltzner: One of my most prevalent modes of failing comes about because I am anxious in the presence of the open question. Way back when I was a student, following my own curiosity and making a transition from music into science and engineering, I recognised that I had to learn to hold onto that open question. I called it holding onto the doubt. I had to be able to sit beside that open question without feeling anxious, without rushing. If I did that my answers were better [because] I more deeply understood the question. This is not analysis paralysis. I’m not talking about waiting until you have 100% certainty in the answer. These are fuzzy questions for which there won’t be a final analysis until Mars, and you’ll have to invest billions of dollar to get there. Those are the questions I love. Frequently the answer lies inside the question, like a bud waiting to bloom. When you’re up against a question that subtle, you have to hold onto the doubt and really sit long enough in its presence to let [the answer] unfold in front of you. You also talk about the “dark room”: hitting a wall in the creative process and wondering if you’ll ever find a way through. How did your team deal with those moments? Steltzner: Our schedule is set by celestial mechanics, so we have time constraints that we cannot move. When you are up against an impasse, a creative block, an inability to find a solution, you can become very anxious. You feel like you’re in this dark room, this black state, and you don’t know where the exit is. Sometimes you don’t find the exit until you’ve given up trying. It’s not that you’ve given up hope, or resigned yourself to always being in the dark room. It’s that you’ve let go of your preconceived notions about what that solution was going to be. You’ve got to be open to a broader set of solutions. In the book, I use the discussion of the air bags on the Mars exploration rovers Spirit and Opportunity as an example. We kept breaking airbags on this tiny innocuous rock, shaped like a liver or the heart of a cow. It was busting through our airbags at an alarming rate. [Eventually] we let go of trying to make them more abrasion resistant and just designed them to survive the puncture and live for another day. We needed to get to that place — to stop trying to drive in the same direction, and be open to finding a different path — before we could find our way out of the dark room. The sky crane concept sounded completely nuts when you first proposed it; now we know it was, as your title suggests, just the right kind of crazy. But there’s a fine line between a stroke of genius and stubborn delusion. How do you know when to fight for your idea, and when to let it go? Steltzner: It comes down to self-awareness. If you’re operating at the edge of what’s possible, you’re using your subconscious mind, operating in a region where delusion is really easy to do. Even a group can adopt an idea and fall in love with it. So it’s a constant process of checking in to say, is this really the right solution? Am I doing this right? I’m in love with it, I think it’s brilliant, and it came out of my mind, but is that the right thing for us to be doing? What is the next engineering challenge you face? 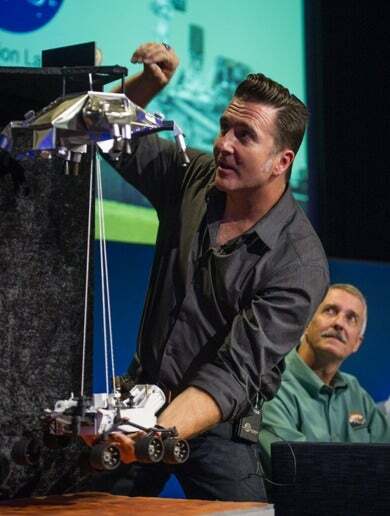 Steltzner: I’m the chief engineer of the Mars 2020 project, the next big expedition to the surface of Mars. We hope it will be the first in a multi-mission series to bring samples back to Earth from the surface of Mars. We are not doing the return on this project. The major challenge is taking core samples in a super sterile, hermetically sealed way so that no biological artefact of Earth contaminates them, because we’re going to be looking for life. And we don’t want to find the common cold virus. That is the challenge of this mission. The next mission will go and pick them up and return to Earth. I certainly hope to be part of that one, too. Images: (top): Adam Steltzner tensely awaiting news on Curiosity’s landing in 2012. Credit: NASA/T. Wynne. (bottom) Steltzner demonstrates the sky crane. Credit: NASA/Bill Ingalls.